TOKYO – Nikon Corporation is pleased to announce the introduction of the COOLPIX S550, a stylish new camera that elegantly packs high performance and advanced functions into the smallest body in its class*1. 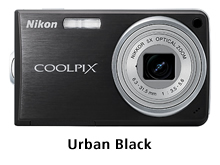 Built on a custom application of Nikon’s innovative EXPEED digital image processing concept and incorporating the precision optics of a NIKKOR lens, the COOLPIX S550 brings new ease and fun to capturing smiling faces in the full beauty of special moments. 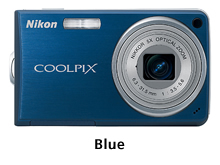 The COOLPIX S550 teams 10 effective megapixels of sharp resolution with quick response, and maintains image quality when taking advantage of sensitivity settings as high as ISO 2000. Enhancing compositional freedom is a 5x Zoom-NIKKOR lens with the range to ably cover scenes from buildings and group pictures to close-up portraits. Unique new functions for the COOLPIX S550 help make it easier to shoot beautiful portraits and faithfully record precious smiles when they appear. Smile mode displays a gauge that indicates when the selected subject smiles, enabling the user to capture just the right moment. Blink warning displays a message when it detects that a subject has blinked, offers quick magnified visual confirmation, and allows the shot to be retaken immediately. The COOLPIX S550 will be available in a choice of Titanium Silver, Urban Black, Blue, or Purple body colors*2. 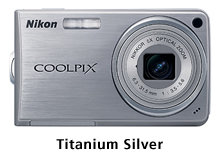 *1 Among competing 10 effective megapixel class compact digital cameras equipped with retractable 5x zoom as of January 29, 2008 (according to research conducted by NIKON CORPORATION). *2 Color availability may vary according to region. Compensating for the effects of camera shake to realize sharper results, electronic VR (Vibration Reduction) image stabilization frees you to enjoy capturing special moments without worrying about slight hand movements, particularly in lower light conditions. Extended light sensitivity range with manual settings up to ISO 2000 makes it easier to take great-looking pictures in lower lighting conditions, or to capture moving subjects with outstanding clarity. Automatic sensitivity control is also available, freeing you to concentrate on the shot while the camera selects the optimal setting across a range between ISO 64 and ISO 800. And High-Sensitivity mode minimizes blur by automatically selecting optimal light sensitivity. The COOLPIX S550 is equipped with a quality 2.5-inch LCD monitor that features 230k-dots of high resolution, a wide 170-degree horizontal and vertical viewing angle, anti-reflection coating for better display in bright situations, and an acrylic panel that prevents scratches and fingerprints. Improved shooting displays with revised icons and information feedback help make framing and shooting easier.